In view of the recent alleged poisoning of a former Russian spy using a nerve agent, is it time to reassess how the UK classifies the CBRN threat? Chemical, biological, radiological, or nuclear (CBRN) warfare is such a broad-ranging threat and there are so many different aspects to it (protective equipment, handling and disposal of hazardous materials, detection and identification, containment), which makes defending against it challenging to say the least. CBRN is what can be described as low probability, high risk: While the probability of an attack using chemical, nuclear, biological or radiological weapons may be low, if such an attack were to occur, the results could potentially be catastrophic, hence why speediness of response is important. The CBRN threat landscape is complex and varied, but in recent years the major threats have tended to focus on countries like Syria, where, on at least six separate occasions over the past four years, chemical weapon attacks have been launched against the civilian population. However, the alleged poisoning of a former Russian spy in Salisbury recently using a nerve agent, has raised questions about how the CBRN threat is classified, and how best to safeguard against it. In the UK Government’s 2015 National Security Risk Assessment, a CBRN attack was categorised as a Tier 2 risk (Tier 2 and Tier 3 risks are classed as important and require action, and are the next highest priorities after Tier 1 risks). Tier 1 risks highlighted in the 2015 NSRS included terrorism, cyber attacks, international military conflicts, public health, major natural hazards and overseas instability. Chemical weapons are often thought of as something that belong to a different era – the Cold War period. The US and Russia still have large stockpiles of chemical weapons that haven’t been destroyed, although Russian president Vladimir Putin was recently quoted as saying it had destroyed all of its stockpiles, which were believed to be in the region of 40,000 tonnes. In addition to old stockpiles of chemical weapons, Western governments have long feared a chemical weapons attack by terrorist organisations such as ISIL or Daesh, who are believed to have acquired the capability to manufacture chemical weapons. A European Parliament December 2015 Briefing Paper stated that the EU should be on alert for an attack using banned weapons by ISIL or Daesh. The group's next "weapon of choice," the paper says, could be an Improvised Explosive Device containing chemicals or radioactive materials. Alarm bells have also been raised about the threat of biological warfare or bioterrorism by state-sponsored actors. There are obvious inconsistencies in the resources allocated to address the nuclear threat and those aimed at safeguarding against a chemical weapons attack, which, it could be argued, is a more likely scenario than an all-out nuclear war, despite North Korea’s recent barrage of nuclear missile tests. There was a time, in the UK , when the government placed even more importance on CBRN and the threat of an attack. The 1998 Strategic Defence Review White Paper, established a Nuclear, Chemical and Biological Defence Regiment, comprised mostly of Army (75%) and 25% Royal Air Force personnel. 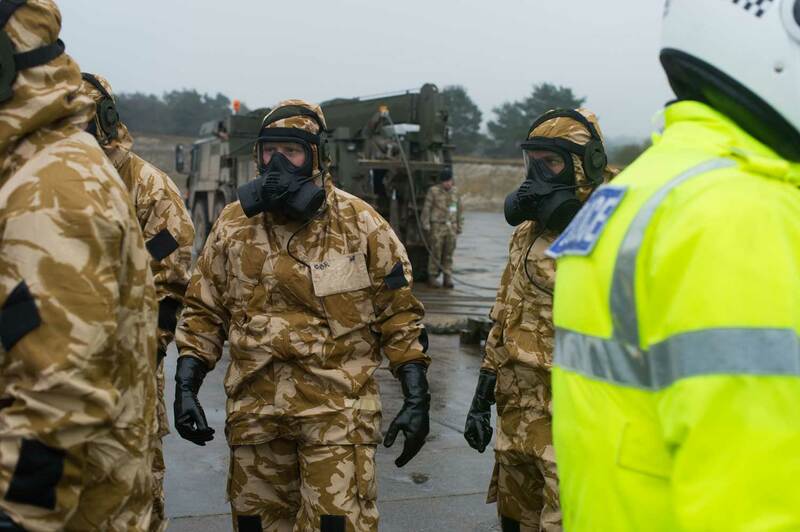 The Regiment was based at RAF Honington in Suffolk and utilised specialist CBRN equipment such as the Fuchs Nuclear and Chemical Reconnaissance and Survey vehicle, an Integrated Biological Detection System (IBDS) and the Multi-Purpose Decontamination System (MPDS). 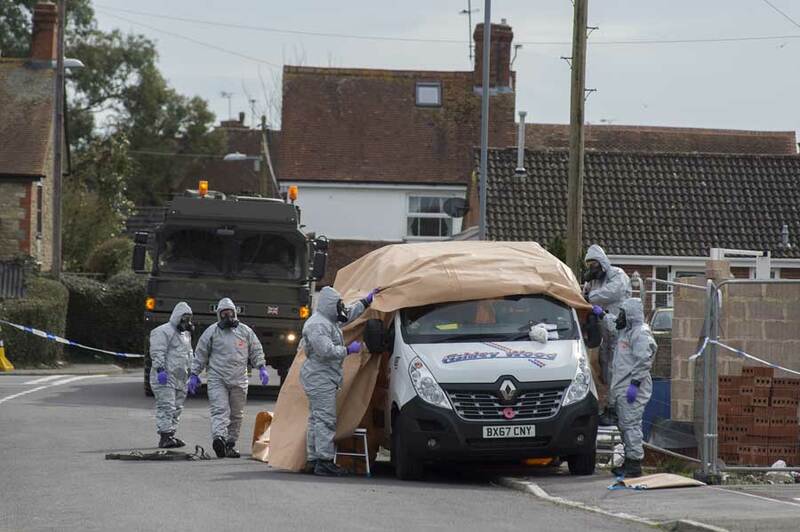 In addition to providing an “essential element” in any joint force operations where there was a CBRN threat, the regiment was also charged with assisting civilian authorities with radiological, biological or chemical hazards, such as the one that happened in Salisbury recently. Despite making a major contribution, the Regiment was disbanded in 2011 due to defence budget cutbacks. Five years later, in response to chemical weapons attacks in Syria, the UK Ministry of Defence brought back the Fuchs “armoured sniffer vehicles,” which scout ahead looking for CBRN hazards on the battlefield. The vehicles are operated by Falcon Squadron, which is part of the Royal Tank Regiment, and it was this squadron that recently assisted the emergency services in Salisbury. The events over the past week or two in Salisbury, however, have led some such as Hamish de Bretton-Gordon, a former commander of the disbanded Joint Chemical, Biological, Radiological and Nuclear Regiment, to call for its reinstatement. “I expect we need a new one as soon as possible,” he was quoted as saying in The Guardian. With the disbanding of the Joint CBRN Regiment, de Bretton-Gordon and others suggest that deep CBRN knowledge and experience of things like the alleged attack in Salisbury and how best to deal with such events has been lost. A resurgent Russia is shaping defence procurement in other areas — the demonstration of a “hard-kill” Active Protection System on board the Russian Armata T-14 tank has led NATO countries, namely the US, to speed up the deployment of an off-the-shelf solution on board the Abrams and Stryker vehicles and is also impacting armoured vehicle retrofit and upgrade programmes across Europe. So what impact is the release of a chemical nerve agent on British soil, which the UK government alleges is linked to Russia, likely to have on the the National Security Strategy and Strategic Defence and Security Review, which were last updated in 2015 and are due for renewal in 2020? In 2017, the UK government announced a National Security Capability Review, which will look at “how the threats and the wider security environment have changed since 2015.” It will be interesting to see what impact, if any, the alleged nerve agent attack in Salisbury has on the way the UK government classifies the CBRN threat and the resources allocated to address it.